It’s now 35 years since the world lost Robert Nesta Marley, better known of course as Bob Marley, the legendary musician who succumbed to cancer aged just 36 on May 11 1981. During his life, Bob spent so much time in London that it effectively became his second home. Here are some of the locations associated with Jamaica’s most famous son. 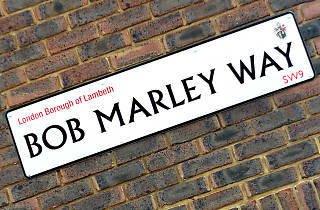 Bob Marley was first invited to London in 1972 by Johnny Nash; the US singer behind ‘I Can See Clearly Now’. Bob and the Wailers were already big in Jamaica and Johnny hoped to secure them a wider audience by cutting a deal with CBS records. On arrival, Bob’s first digs were at Flat 34 Ridgmount Gardens – a quiet backwater tucked between Gower Street and Tottenham Court Road. A plaque commemorating his stay was unveiled in 2006. At first Bob struggled to get noticed in London; a problem he discussed with art teacher Keith Baugh one evening at Soho’s ‘Bag O' Nails’ club. Keith suggested it might be a canny publicity stunt if Bob and Johnny popped by his school for an impromptu concert. Sure enough, the two musicians rolled up to Peckham Manor’s gates a few days later and proceeded to rock the school’s gym. The school’s since closed but its gym remains as part of the Damilola Taylor Youth Centre. Like many newly arrived Londoners, Bob did his fair share of sofa-surfing. After Ridgmount Gardens he spent a brief period at Old Church Street, Chelsea where he hooked up with fellow Wailers members; brothers Carlton and Aston ‘Family Man’ Barrett, Peter Tosh and Bunny Wailer. The friends then shifted to 12A Queensborough Terrace, a grubby bedsit where the lack of cooking facilities made it tricky to uphold their Rastafarian Ital diet. Luckily there were enough chippies and Indian veggie restaurants around nearby Queensway to keep Bob and the group going. Let’s face it, a lot of Londoners are closet transport geeks. And it seems Bob Marley was no exception because on April 30 1972 he headed to Victoria station to catch the last ever ‘Brighton Belle’; a luxury railway service that’d been running Pullman trains to the seaside since the 1930s. Just like today, bidding farewell to old rolling stock was a big deal and the event was celebrated with a gala and media coverage. After their cramped stay in Bayswater, Bob and the Wailers found a new yard in Neasden, moments away from the roar of the North Circular. A plaque commemorating their residence at this unlikely semi was unveiled in 2012 by Professor Gus John. Bob’s son, Julian also attended the ceremony. Despite Johnny Nash’s efforts, it soon became clear that CBS had no interest in Bob and the Wailers meaning the lads were effectively abandoned. Taking initiative, Bob sought out the Notting Hill HQ for Island Records where he met the label’s founder, Chris Blackwell. Bob asked if Island would be interested in funding a single, but so impressed was Chris with the young Rasta he insisted the group aim for an entire album. The result was ‘Catch a Fire’ which paved the way for international recognition following its release in April 1973. Bob would return to Basing Street in 1977 to carry out work on ‘Exodus’ and also spent time living in the studio’s on-site apartment. Shortly after the release of ‘Catch a Fire’ Bob Marley and the Wailers headed to BBC Television Centre, Wood Lane to record a classic set for the ‘Old Grey Whistle Test’. They also cut a session for a radio show called ‘Top Gear’ (no, nothing to do with Clarkson) at another BBC base in Shepherd’s Bush called Kensington House. It’s now the K-West hotel. The Lion King has topped the bill here for years, but in a former incarnation this theatre on the edge of Covent Garden was a music venue known as the ‘Lyceum Ballroom’. It was here in July 1975 that Bob Marley and the Wailers played to a sweltering, sellout crowd, the recording of which (made with the aid of a mobile studio provided by the Rolling Stones) was released as the celebrated ‘Live!’ album. Alongside music, Bob’s other passion in life was football. 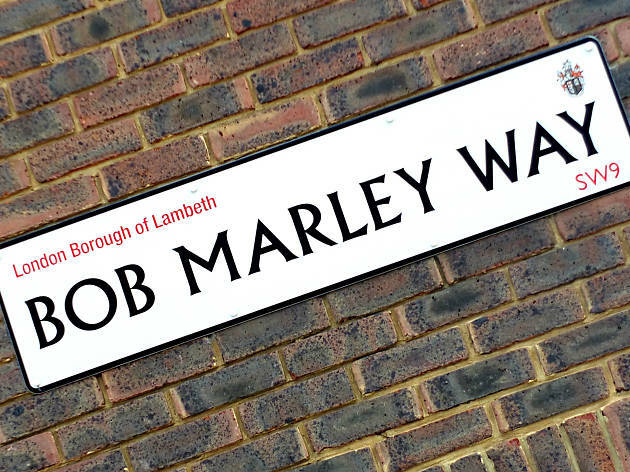 While living at Oakley Street he, the Wailers and other friends would frequently make the short trip across Albert Bridge to the pitches at Battersea Park where they enjoyed many a match. Fellow reggae great Eddy Grant (who’d later record ‘Electric Avenue’ as an ode to Brixton) was also known to team up. Bob and the Wailers made use of two Island Records studios to record ‘Exodus’ in 1977 and ‘Kaya’ in 1978; the Basing Street site (see above) and a facility nicknamed the ‘Fallout Shelter’, located between British Grove and St Peter’s Square, Chiswick. Converted from an old Victorian laundry, the Chiswick studio remains in use today. In May 1977, Bob Marley and the Wailers embarked on the ‘Exodus’ tour which was scheduled to tour across Europe and the USA. While in France, Bob played football against a team of journalists and sustained a serious toe injury. By the time the tour reached London's Rainbow Theatre, he could only manage four out of six nights at the Finsbury Park venue and the rest of the tour was cancelled. It was this toe injury which led to the discovery of the melanoma that’d eventually claim Bob’s life. Named after a Guyanese bird, the Keskidee Centre opened in 1971 as Britain’s first black-led arts hub. Marley came to the Keskidee in 1978 to shoot the video for ‘Is this Love’ which involved partying with a big group of London kids – including a young Naomi Campbell – before leading them out for a dance on Gifford Street. After suffering financial strife the centre closed in the early '90s but was commemorated in 2011 by a plaque unveiled by MP, David Lammy. Sadly the building was gutted by fire in 2012 and has lain in ruins ever since. The Crystal Palace Bowl (or ‘rusty laptop’ as it’s been nicknamed since its '90s makeover) is an outdoor music venue in Crystal Palace Park which has entertained music fans since the early 60s. Bob Marley and The Wailers turned up here on June 7 1980 to take part in the ‘Summer of ’80 Garden Party’ festival, performing a 14-song set which concluded with ‘Redemption Song’. By this point Bob was becoming gravely ill and had less than a year to live. The concert at Crystal Palace marked his last ever UK appearance. Bob was first memorialised in a London mural in the late '70s when his portrait appeared on the wall of an MOT garage on Coulgate Street, Brockley. The mural survived the ravages of time until 2014 when it was destroyed to make way for (yep, you guessed it) a block of flats. Thankfully local residents clubbed together to arrange funding for a new artwork, the commission of which was given to street-artist, Dale Grimshaw. Dale’s brilliant new design was unveiled on the wall of the Brockley Barge pub in 2015 and is a fitting tribute to the late, great icon. Long may it remain. Check out 11 recording studios in London every muso should know.